We pulled off the motorway to Granada, stepped out of the car and were ankle deep in a sea of yellow oxalis. Spring’s unusual weather continued as splats of rain reminded us that summer hadn’t quite yet arrived. 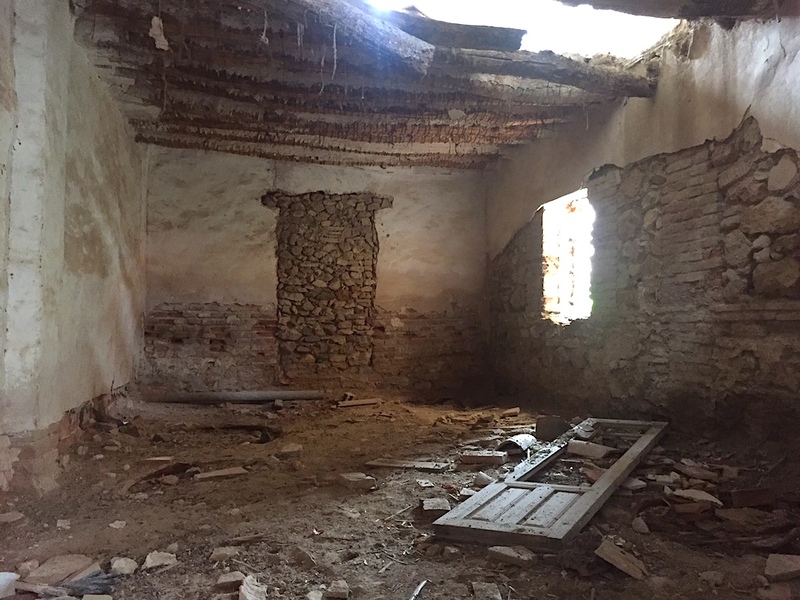 Like a carcass stripped of flesh by vultures, the ghost village is now just stone, plaster and wood. 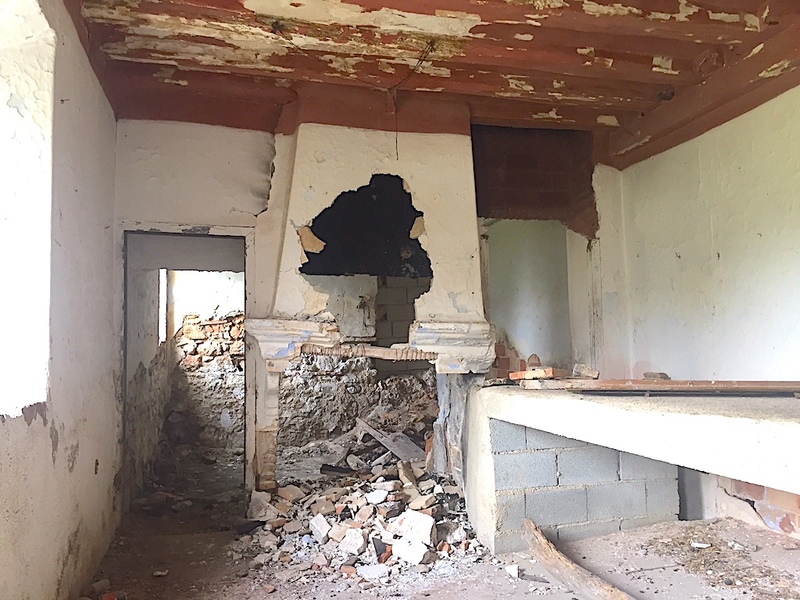 Doors, fire grills, balconies and tiles have all but been removed, leaving an eerie collection of buildings; the warm breeze whispering through windows robbed of their frames. 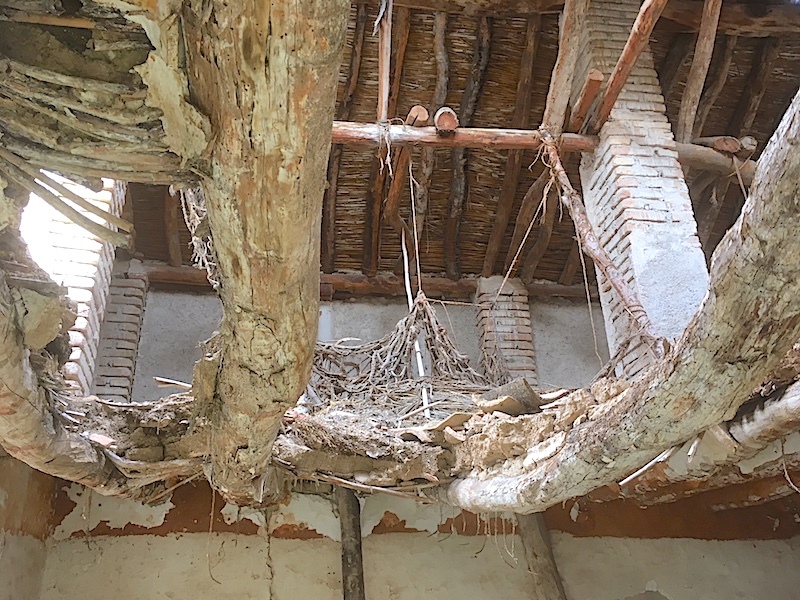 Nature had taken over with birds’ nests in corners. 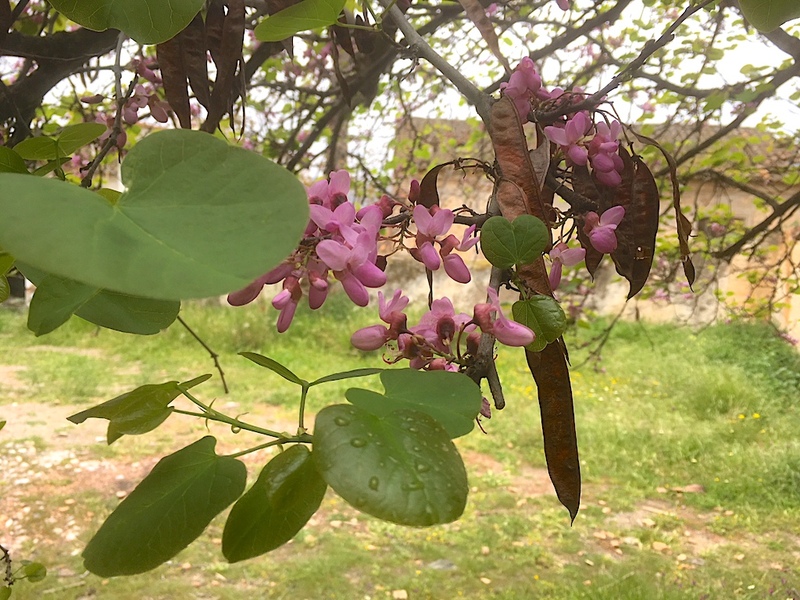 The branches of a Redbud tree (Cercis siliquastrum) reached into the ruins; an unwelcome guest with its dry pods rattling like coins in an old purse. Due to its strategic position (as mentioned in the bridge section below) an ancient fortress existed at Tablate; the ruin still stands on the hill. Over the centuries the area became more populated and a church was built between 1561 and 1563. It was rebuilt in 1605 with a shiny new bell, added to wake everyone up – unless they were already awake and out with their goat herd or slaughtering chickens. A ‘proper’ village emerged in the first part of the 19th century. At one point around 400 people lived here and it was once owned by a wealthy family from Granada who lived here and rented buildings. Others owned their property. Rent, as most people know it, was almost non-existent; instead half of the tenants’ produce from the land was given over in lieu of payment. 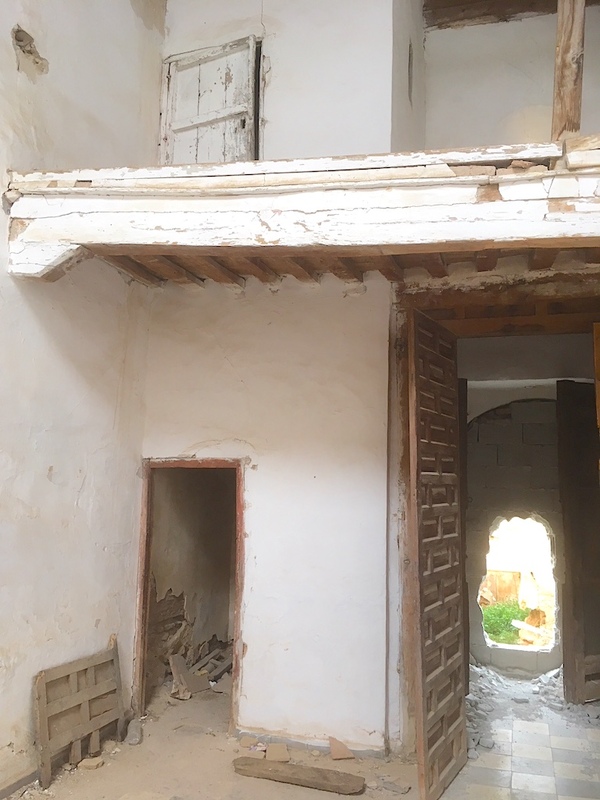 It was the 1960s that saw Tablate leaking its inhabitants who left to find work elsewhere (mainly Barcelona) – something common in the villages of La Alpujarra. By the end of the 1970s only ten families remained and by the late 1990s, only one. The last drop of the village’s blood had drained from its veins, leaving it to decay and fall into the hands of looters and lovers – their love hearts scrawled onto the walls. Today it’s hard to make up what each building was once home to. There were olive and grain mills from which the produce was taken to be sold in Lanjarón, Béznar and Ízbor. People sold vegetables, oil, fruit and animal products at local markets, just like today. 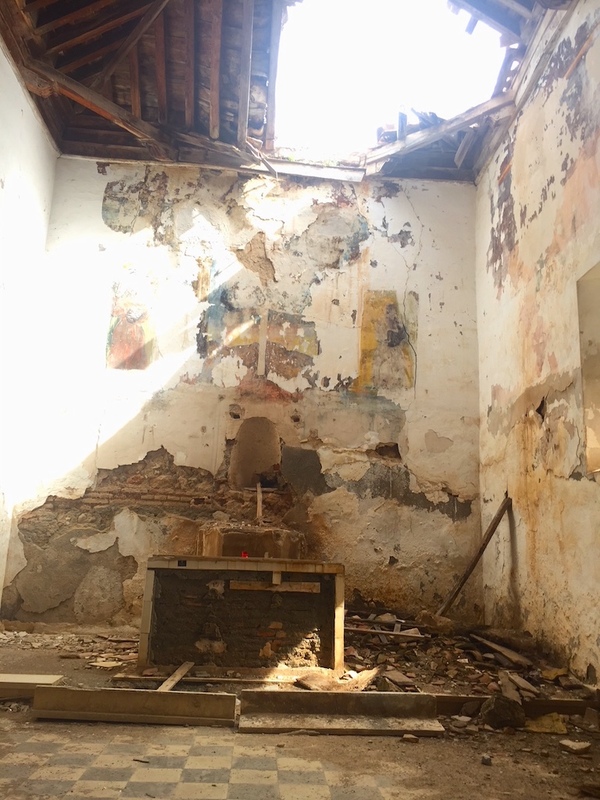 The small church with fading wall frescos behind the altar dominates the village. We couldn’t quite summon up the courage to ascend the dark spiral staircase up the tower. Too many horror movies flicking through the brain and, besides, a gallery – with access via a small door off the staircase – looked like it could collapse at any moment. Stuck inside a tower – with weak, listless hair – was not on the agenda, especially with no one to hear our shouts. It’s not the sort of place to visit after a few vinos, for sure. You wouldn’t want to join the last person to have been buried here, 47 years ago. 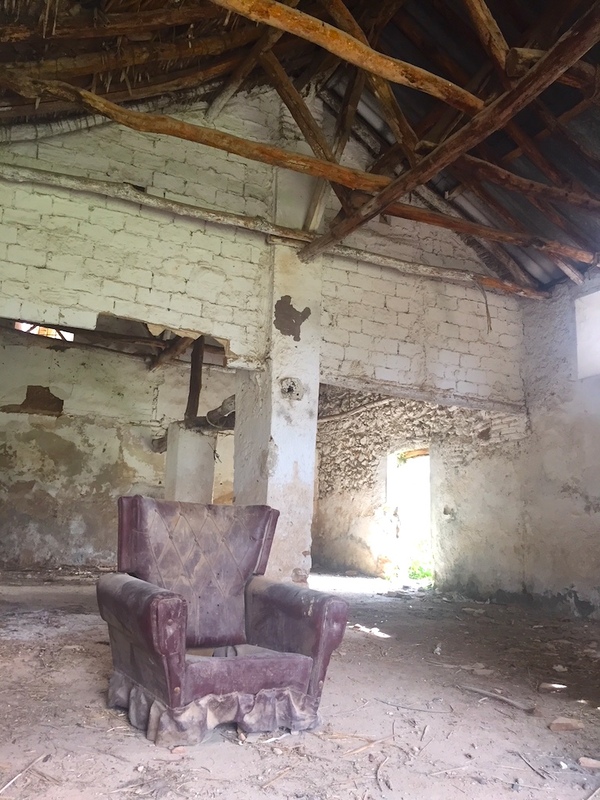 Despite its dilapidation, there was a lot to be admired including old fireplaces with decades-old soot still encrusted on the chimneys – plus beautiful ceilings, even though most had gaping holes with broken wooden beams and tiles scattered beneath. It was a joy to visit. Below is a short film of Tablate captured by drone. It’s fabulous and by local area expert Badaje (Twitter @Badaje). In it, you’ll see this sad, unloved village from above and may wonder why it ever got this way. A bridge over troubled water? 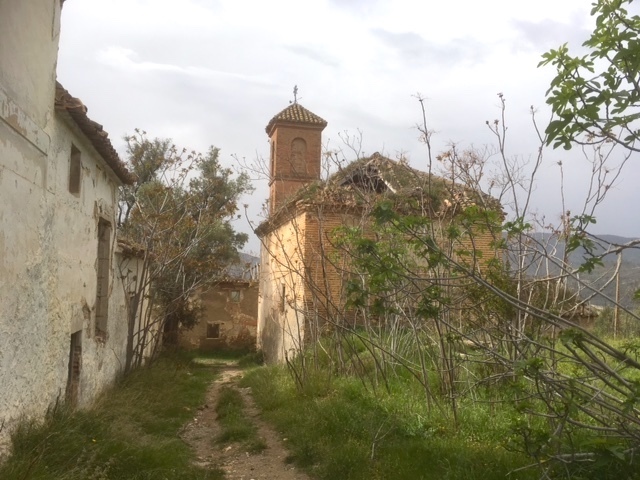 perhaps, as it’s featured in battles, been knocked down and rebuilt, added to and was, eventually, removed from use as the main link between the eastern and western Alpujarras. Standing on the narrow bridge above the Tablate ravine, and with a hint of vertigo – as the trees and shrubs spiral beneath to the hidden, but audible, rush of water – it’s easy to imagine just how important this bridge once was. A symbol of defiance. On arrival, it’s another (mid-19th century) bridge – itself resting in the shadow of a vast metallic bridge hoisted into place in 2003 – that we assume is the ‘old’ one. 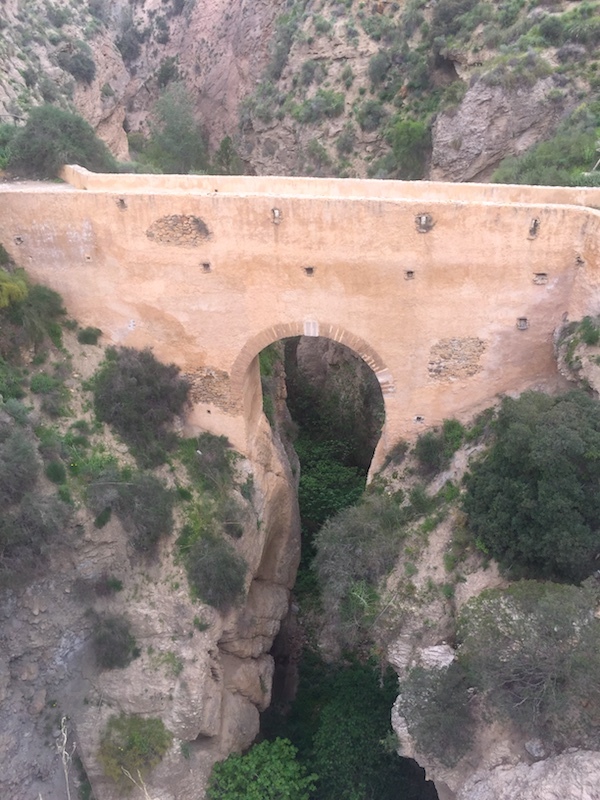 But a few paces on and a glimpse over its low wall reveals Puente Nazari. And then that sudden feeling arrives when you look at something old and lost in time: when you block out the rumble of traffic, avert your gaze from the wind-farm sails and search for kestrels circling above. Anyone who has visited La Alpujarra in Granada province will be familiar with the terrain and how hard it must have once been to actually get anywhere on foot or mule. The A44 stretching from Granada to the coast is the modern relative of the narrow road with pockets of villages and stone buildings on its route. Many old homes, if not flattened by the motorway, have surrendered to the elements; roofless and crumbling. Tablate is among them; the goat herds and laughter of children playing after dusk, long gone. Puente Nazari crops up in records in the late 1400s, though its origins – as the name suggests – go back further. Like many bridges over time, whose main task was to allow passage from one place to another that otherwise would prove difficult, its history permeates the area. If you have any knowledge of Spanish history you’ll know that following the Reconquista – which culminated in 1492 when the Christian monarchs Isabel and Ferdinand took control of Granada from Boabdil – Muslims had a tough time of it, especially as the 16th century progressed. The Muslims of Granada who did not want to leave Spain were forced to convert to Christianity (known as ‘Moriscos’). 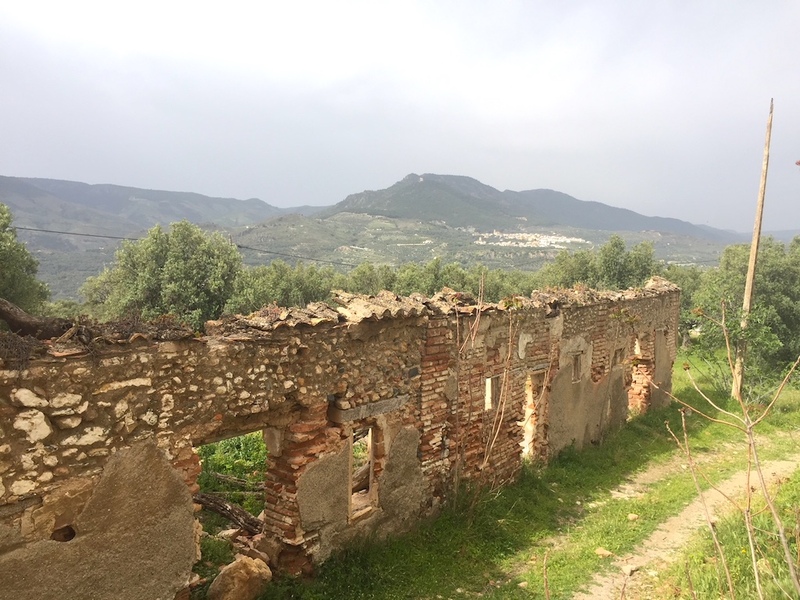 Many did but others left for the villages of La Alpujarra where the Moors – mainly Berbers from north Africa – had already transformed the landscape centuries before into what we see today. The first Muslim rebellion in the area was in 1500. Around 3,500 troops were sent by the monarchs to end it, which they did, but not before the bridge was destroyed to hinder the troops’ progress (the army went on to Lanjarón and destroyed half the castle before heading off to Órgiva to rescue some Christians holed up in, what is now, the town hall). The bridge was rebuilt over 1502. Many Muslims ignored various royal edicts to convert (good for them! ), practicing their religion in secret until things got messy in the mid-1500s. In 1566 Philip II – who was later to fire the starting gun for the Spanish Armada – decided no one should speak Arabic or wear traditional dress, which led to another short-lived uprising. It was to be the final one. In 1571 an army was sent to crush it. To keep the troops at bay, the bridge was destroyed again. Look closely today and the bridge does look like it’s been patched up many times. It would take around 35 years until the Moriscos – and Muslims who had carried on living as they saw fit – were forced to leave Spain for ever. The number was around 350,000, many living around Valencia. So, a humble little bridge got a fair beating at different times. Today you can walk over it on a path constructed to admire all four visible bridges. 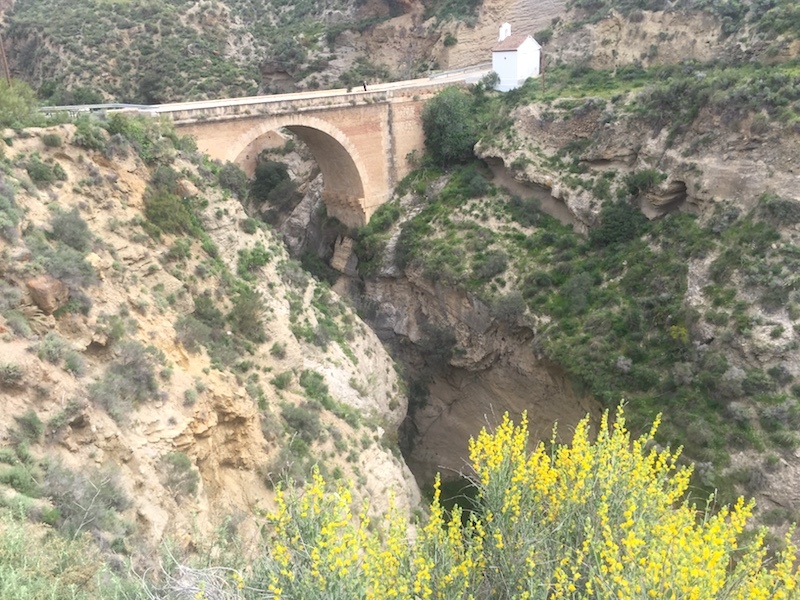 The cute Ermita de la Virgen de las Angustias is at one end of the 19th century bridge. After today, exploring the area in the humid heat, we were weary – and feeling small – surrounded by these monuments representing different times. Bridges to the past…and future. I recently visited this abandoned village and heard at second hand from someone who was said to be something of an ‘expert’ on the village history to the effect that there had once been a mining activity (iron ore ?) in the vicinity and that a cable car had been constructed from Tablate to transport ore down to the coast for export. This would have been a considerable enterprise and I could find no immediate evidence of any machinery or building (s) to house such. I have heard of other such enterprises in this part of the world in the first part of the last century eg in Orgiva, but would be glad of any anecdotal or other evidence to support this tale of mining activity in Tablate. Hi Jeni – we are unaware of any mining activity in the Tablate area but can look into it further. The Sierra de Lújar, which rises above Órgiva, is famous for mining (including fluorite and lead) with the material taken to the village of Los Tablones beneath (among other places). There was once a cable car system here, used mainly in the 1970s and 1980s. (Trees were also once felled and taken to Adra for shipbuilding – Los Tablones translates as ‘The Planks’). The Phoenicians were once in the area – it’s had quite a history!